The University of California San Diego and Japan’s National Institute of Advanced Industrial Science and Technology (AIST) have agreed to a new five-year pact to cooperate on research in the fields of computer science and technology, including artificial intelligence and other data-intensive domains. On January 10, representatives of both institutions signed a memorandum of understanding (MOU) outlining some specific areas for potential collaboration. AIST was represented by Satoshi Sekiguchi, Director General of the Japanese institute’s Department of Information Technology and Human Factors. Due to her travel schedule, UC San Diego Executive Vice Chancellor Elizabeth H. Simmons pre-signed the non-binding MOU. SDSC’s Papadopoulos also signed on behalf of UC San Diego at a ceremony held at the UC San Diego Faculty Club. As part of the new agreement, AIST and SDSC will share best practices on complementary systems such as SDSC’s Comet petascale supercomputer and Japan’s ABCI hybrid computing cluster now under construction and scheduled to begin operations in fiscal 2018. The MOU covers research, education and the application of scientific knowledge in the field of artificial intelligence (AI). This collaboration is also expected to extend into data-intensive science and robotics. 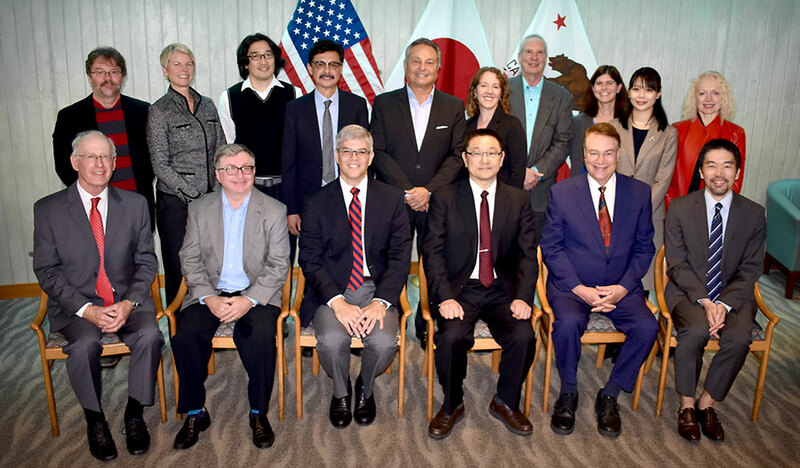 Specific types of activities in the MOU include organizing workshops in fields of mutual interest in Japan and the U.S.; exchanges of AIST researchers with faculty and postdoctoral scholars from UC San Diego; and AIST hosting UC San Diego students to work on related research projects in Japan. The two sides will also collaborate on cyberinfrastructure projects, notably involving the UC San Diego-based and National Science Foundation-funded Pacific Research Platform (PRP) and Cognitive Hardware and Software Ecosystem Community Infrastructure (CHASE-CI), as well as AIST’s AI Bridging Cloud Infrastructure (ABCI). Both PRP and CHASE-CI are led by Calit2 Director Larry Smarr, a professor of Computer Science and Engineering in UC San Diego’s Jacobs School of Engineering. PRP links more than 25 universities and other research institutions in the western U.S., while CHASE-CI’s 10 member research universities are deploying a cloud of affordable graphics processing units (GPUs) networked together with non-von Neumann architectures to facilitate development of next-generation cognitive computing. Papadopoulos is a co-principal investigator of the PRP project, funded by a five-year, $5 million NSF award. Japan’s Ministry of Economy, Trade and Industry is funding the acceleration of AI deployment with a grant of approximately $175 million (19.5 billion yen), which includes 5 billion yen for the ABCI facility. Click to view a graphic of the ABCI facility (PDF). AIST’s vision is to create a global partnership with UC San Diego and other Pacific Rim organizations. Under this MOU, AIST gains access to UC San Diego researchers and students who will bring new perspectives and knowledge, while UC San Diego benefits from access to ABCI's large-scale computational resources – giving university researchers the opportunity to perform data-intensive research for AI on an unprecedented scale. Previously, AIST and UC San Diego worked together through UC San Diego’s Pacific Rim Application and Grid Middleware Assembly (PRAGMA) computer science research community to maintain services provided by AIST during the 2011 Tohoku Earthquake. PRAGMA – which is led by SDSC’s Papadopoulos – was established in 2002 with UC San Diego and AIST among its founding members.